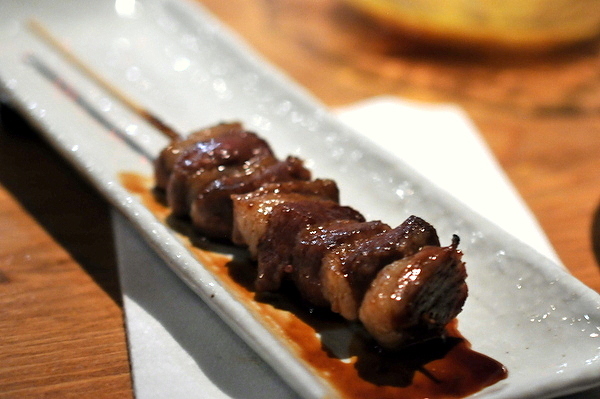 A good rule of thumb when traveling: eat where the chefs eat, and in Vegas that means Aburiya Raku. Opened in 2008, the restaurant has received a slew of accolades including three James Beard Nominations: Best New Restaurant (2008) Best Chef Southwest (2011, 2012). 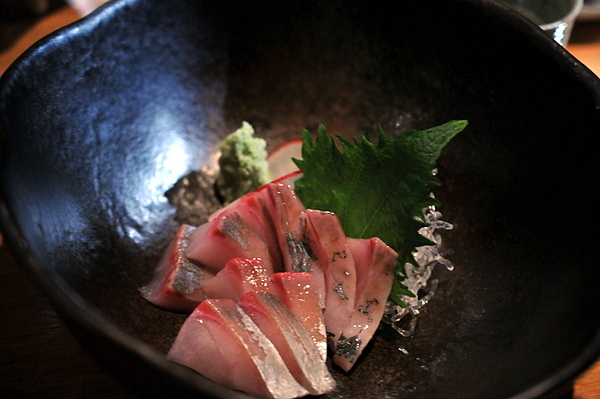 Raku's owner, Mitsuo Endo, got his start working at top Kaiseki restaurants in Tokyo. After spending a year in Seattle, Endo moved to New York and helped open MEGU in Tribeca and Midtown with his mentor, Koji Imai. In 2007 Endo moved to Las Vegas to open EN where he would remain for a year before striking out on his own with Aburiya Raku. 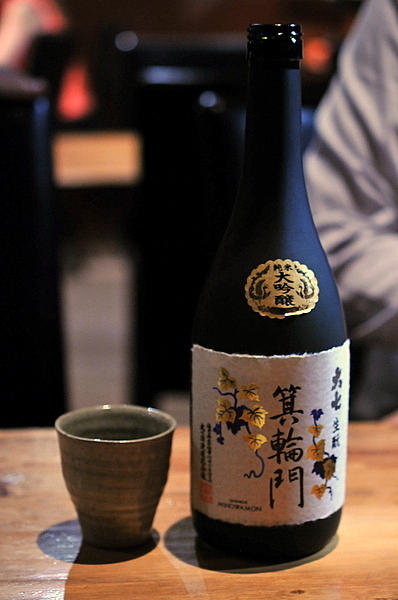 Dai Shichi Minowamon - "The Gate"
The Minowamon proved to be a relatively full bodied sake with a slightly viscous feel that goes down smoothly as well as a complex bouquet of sweet fruit, wood, and flowers. 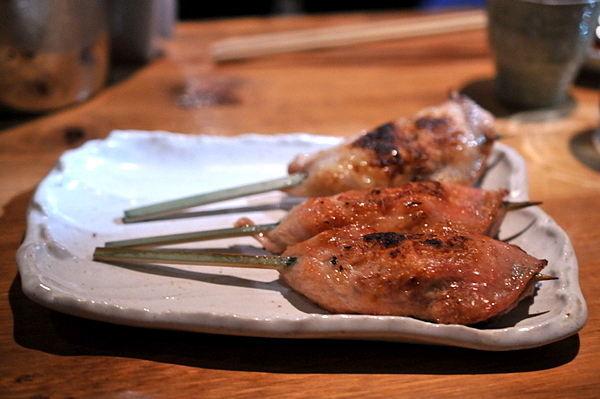 I enjoyed the sake but felt it was a bit too heavy for the food particularly the grilled meats. Named for a Japanese folk hero these prized tomatoes are immensely flavorful with a sweet and sour juiciness that gains a vegetal astringency on the finish. These were still delicious as a starter but they really shone when taken between Robata dishes thanks to their refreshing vigor. 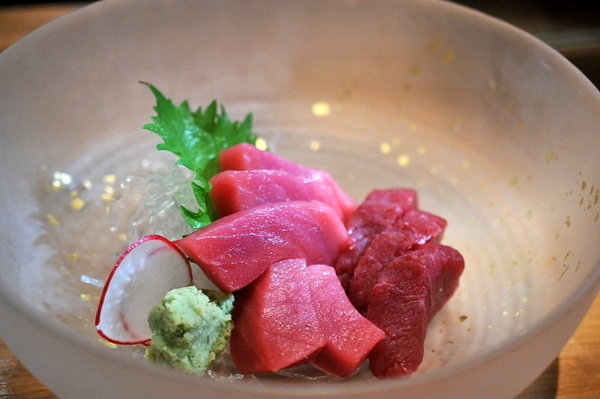 Half of the sashimi was noticeably fattier, with a pinkish color and traces of toro-like refinement. The leaner cut had a coarser texture and a slightly metallic fishiness that was heightened by the house made shoyu. A really classic Amberjack, despite being fairly oily the snappy fish gives of a slight sweetness. Best with a light touch of soy as more would overwhelm the fish. 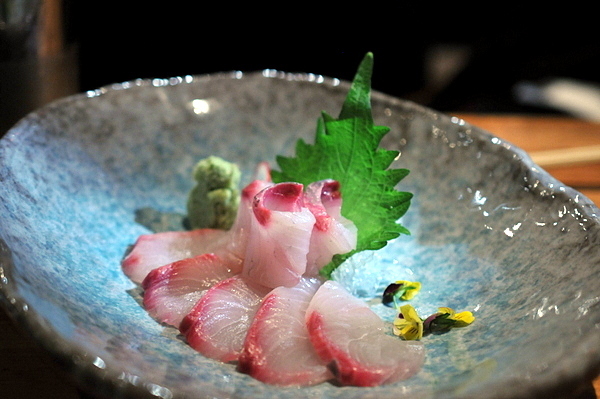 Definitely the most expressive of the three sashimi specials, the flesh has an smooth jellied texture with a medium dose of fishiness. The chicken wings are listed as one of Raku's signatures and with good reason. The skin has a glassy crispness and is loaded with a rich fried sapor. The meat stands up to the delicious skin with a wonderfully tender texture that is saturated with juicy goodness. Despite being insanely full I was tempted to order another round of these. 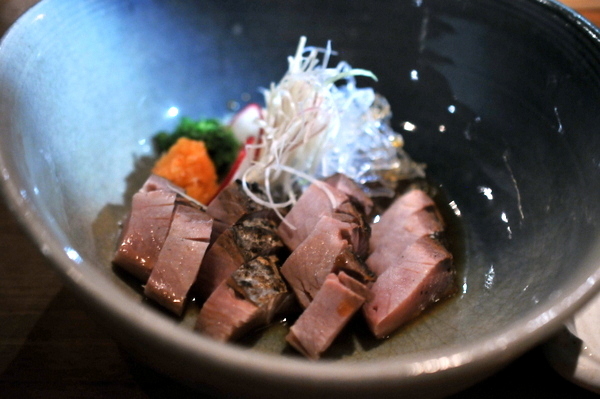 The final special was a seared bonito. 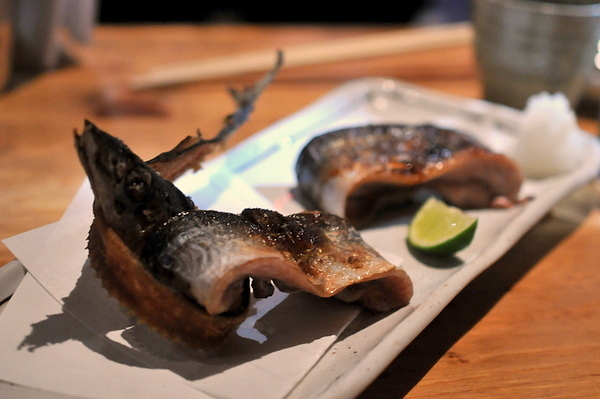 I've had wildly varying experiences with this fish and Raku's tends towards the milder side. Yes there is some woody smoke but the flavor is relatively restrained thanks to the ponzu and accompaniments of ginger, scallion, and daikon. Poached egg and sea urchin are two of my favorite things so its no surprise that I feel compelled to order this dish every time I come here. 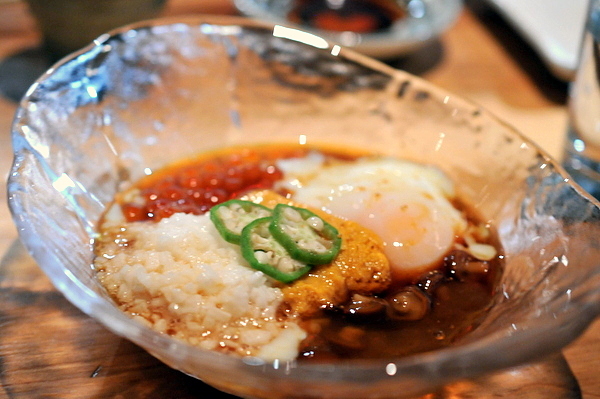 The yamaimo, okra and egg make for a very slimy eating, which can be a challenge for some. The flavor is remarkably subdued, more of an aggregated persistent umami aspect rather than the bold salinity of the uni or ikura. Typically the thigh is the most flavorful part of the chicken but this doesn't hold a candle to the wings in terms of either flavor or texture. Tasty but its hard to appreciate after having trying the wings. This is another of Raku's signatures and perhaps the best tofu that I've ever eaten. 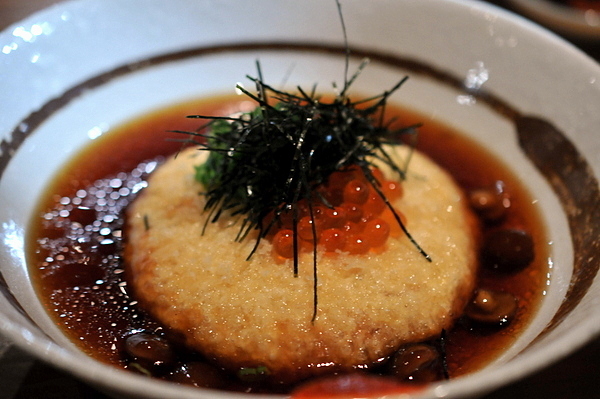 The soft pillowy beancurd has a thin fried coating that soaks up the heady tentsuyu broth. The ikura and seaweed have a salinity that compliments the dashi in the tentsuyu while the pickled mushrooms provide a nice tangy contrast. Hard to find fault with this course. 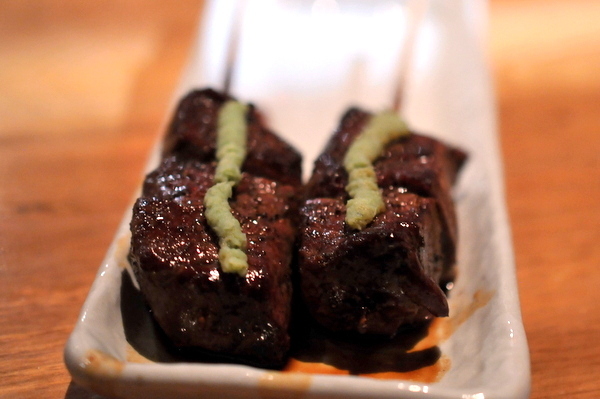 The binchotan adds that extra little touch to an already delicious filet while the wasabi provides a brief burst of heat. Some of my companions opted to add some of the house made green tea salt but I thought the beef needed no additional artifice. One of the specials during my last visit was an Iberico pork under a gelee made from more Iberico. Though I didn't see it on the menu I figured it couldn't hurt to ask. Our waitress said they didn't have the special but could ask the kitchen if they had anything else. 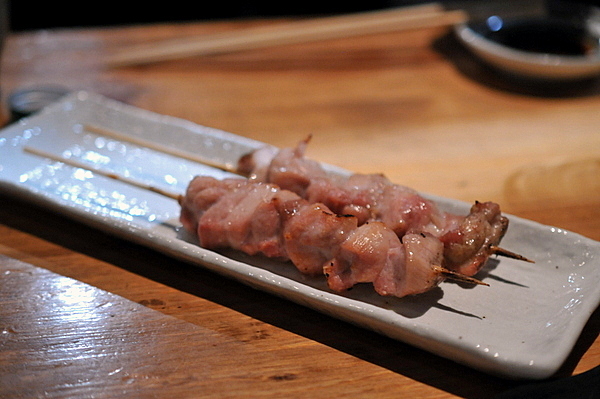 The result was a skewer filled with small pieces of pork that had a balanced mix of fat and lean meat. The succulent morsels were quite tasty, but the sauce was a bit too sweet. Our final course was a massive bowl of cold soba. The noodles have a slick exterior but feel surprisingly substantial. With just a bit of sauce, the lightly herbal bitterness of the noodles is readily apparent though a bit repetitive after a few bites and I recommended eating it between bites of grilled meats to maintain some variety. 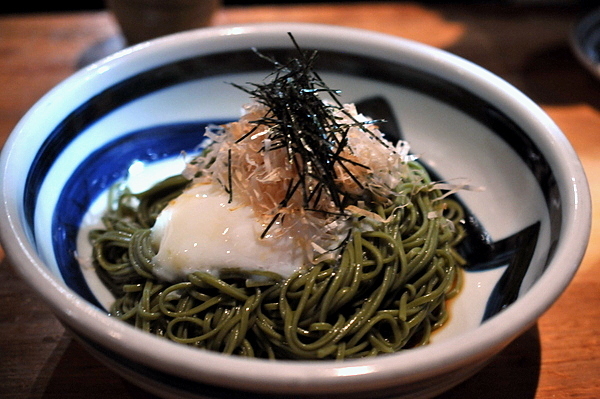 Though a bit off the beaten path, Raku is well worth the effort. 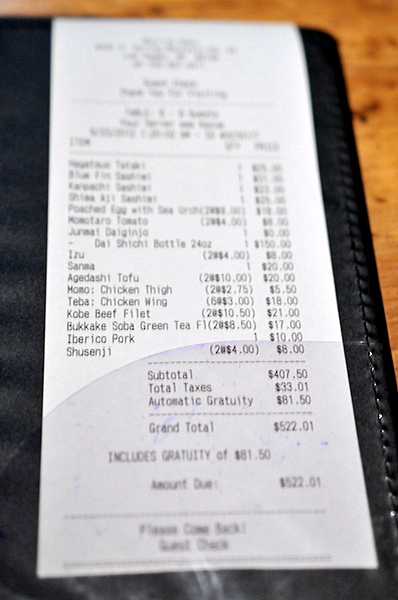 Most people seem to think of the restaurant as a place to go to recover from a night of indulgence. Indeed the menu offers some good drunk food but the restaurant has so much more to offer as the 10 and 15 course Kaiseki menus suggest. I've had three excellent late-night meals at Raku and you can be sure I'll be doing the 15-course Kaiseki the next time I'm in Vegas. Three visits and only one post? 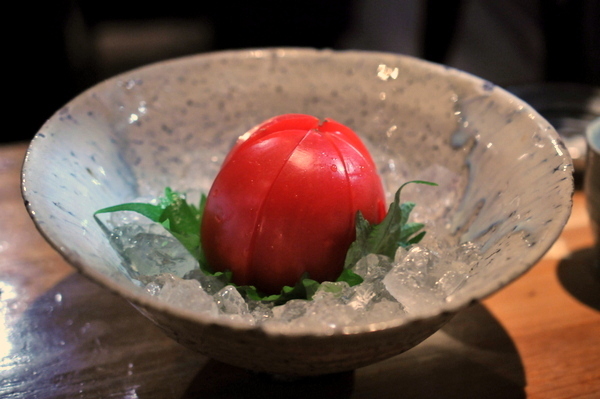 I haven't tried the kaiseki menu either but it's definitely on my list! In my defense, its always fourth meal so I never feel I order enough for a thorough post. You don't mention that it was still good after having finish dinner 1 a couple hours before this meal. This is one of my favorite restaurants. Some of my favorites are the Foie Gras Don, Juicy Deep Fried Chicken, the cold tofu and Agedashi (order half & half), Apple Marinated Lamb Chop, Bluefin Tuna,Uni in Sea Water, and pure dawn or pure dusk sake. This is one of my favorite places in Las Vegas and I am so happy you guys made it here. Poached Egg with Sea Urchin and Salmon Roe is the only time I ever eat okra. Sigh you're making me miss it/you guys!